I remember the very first time I heard this album playing. I was at art college, and someone in one of the studios had it on. I did no work the rest of the day but listened, transfixed, for hour after hour as it replayed. I was stunned. I didn't know such music was possible. It transcended anything i had ever heard before...and you know what? It still makes my spine tingle. If God is into Cream then I shall be happy in his House for eternity. If you only had 2 minutes and 53 seconds to show why Cream were the best rock band ever, then play "Those were the days" off this album. It is percussive perfection. Wheels of Fire remains one of Rocks Classic Albums. Cream is one of the greatest groups ever to step on a stage and this CD is why. The standard White Room opens the CD with a tremendous solo showing Clapton at his very best. Clapton uses the Wah Wah to perfection and plays it very powerfully, as strong as any Clapton Wah or Hendrix Wah effort ever. He continues to play it in concert to this day. Sitting on top of the World to me is a good effort that could have been better. There is something about the Rhythm of the song that is a problem to me. It does have some very nice guitar work. World of Pain is a weak link in a strong chain of songs, nothing to dwell on. As you said is a very curious song. Jack Bruce plays a cello along with an acoustic guitar in an open tuning. I have always wondered why he played the guitar with Clapton at his disposal. It is however a worthy effort. Pressed Rat and Warthog would have made a good children's book. To me this song has always been out of place. Ginger Baker does narrate very well though. Politician follows and is a very strong effort that stands to this day. Outstanding! Those were the days is worth the listen. Born under a Bad Sign is another monster song. It shows Clapton playing the blues the way he can. Deserted Cities of the Heart is another outstanding song and closes the Studio phase of the CD very well. The CD goes live and they open with the Robert Johnson classic.....Crossroads, and Clapton shows the fire he is so famous for to this day. It still might be his most worthy effort. Spoonful is good, but lengthy but does show you what it was like to hear Cream live. The group never had a leader so the solos sometimes got very long. Traintime is next with Jack Bruce's harmonica solo that resembles a train and Toad closes the CD. Toad is a drum solo from Ginger Baker and it features his two bass drums. Ginger Baker to this day might still be the greatest Rock drummer ever and this will show you why. This CD should be put with the Classics, in fact its one of the finest efforts ever recorded. The best of Cream. And as a whole, the best Eric has made with them. He didn't have so much guitar breaks on any other Cream studio release. My favourite are White room, Politician, Deserted cities of the heart, Those were the days, Born under a bad sign, Sitting on top of the world, Crossroads and Spoonful. I have to give it an 8 for the two stupid exceptions on disc 2, Traintime and Toad. But the best rating would be a 10 for CD 1 and a 7 for CD 2. 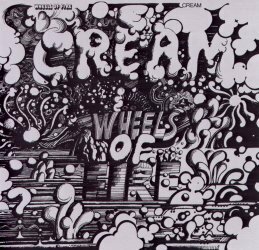 Wheels of Fire must be considered to be one of the great musically works of all time. There is only one track that is not legendary, the rest are without precedent. My favourite track is "Sitting on Top of The World" without doubt. Eric is certainly at his best, Jack gets under your skin with his insistent bass and then there's the best drummer the world has ever seen, Ginger Baker. In my CD collection I consider this to be the ultimate recording. A great album showing the best sides of Cream's duel nature, the studio tracks feature White Room possibly my personal favourite Clapton studio track saying that all the songs are treasures! The live tracks are simply amazing if you understand music! Ginger Baker's drum solo is great if one observes his unique polyrhythmic patterns. There's never been a drummer like him or a band like Cream. If you still have a doubt 'bout why 'Clapton is God', just listen to this one! Blues Prog Rock or whatever you wanna call it, haven't got any better than cream. The set features some blues-rock songs like 'Sitting on top of the World', 'Politician', 'Born under a bad sign' (also listen Hendrix's take on this song), and the superb 'Spoonful' clocking over 15 minutes, full of solos from each member. The Classics 'White Room' and Clapton's trademark 'Crossroads'. If you really like Clapton, then Wheels of Fire is a must have for you. I love the studio stuff, "Sitting On Top Of The World", "Politician" and the classic "White Room" are just some of my favorites. But what made me want to keep listening to this over and over is the 19 minute version on "Spoonful" on disk 2. Words can not explain, but the way Cream plays on that, you can tell why Hendrix started a trio. As much as I love Jimi, Cream was 3 guys soloing at the same time not just Jimi. As wild as the song gets with the band going nuts all at the same time. One thing that no band has done to this day is all play solos at the same time but without "stepping" on each other. If you are a Cream fan, than you should have this album. If you are thinking about what Cream is all about this is IT!!! A classic early entree of the style which made Clapton a legend. Eric's screaming leads on Crossroads surge forth from the very foundation of his soul and set the improvisational standard for all guitarists past, present and future. PLEASE NOTE THAT REVIEWS ARE CHECKED BEFORE PUT ONLINE! IF YOU ONLY SEND "IT'S GREAT". THAT'S NOT A REVIEW!